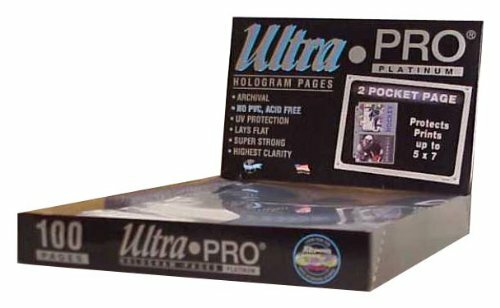 These Ultra PRO Platinum Hologram Pages in two-pocket style are acid free and made with no PVC. These archival quality pages hold sheets 5" X 7" or smaller; ideal for photos, post cards, coupons and other collectibles. Pages are clear on both sides and fit in our standard-size 3-ring albums. The pages have a pre-punched 3-hole spine for our standard sized albums and are sold 100 pages per display. Pages hold 2 5"x7" photos. Product dimensions may be slightly larger to include room for binding holes, packaging, additional protective material, etc.